This time of year always brings about those feelings to change things up a bit, especially around the house. Are you with me? I know you’ve heard it before but a coat of paint really has the power to completely change a look – whether it’s a room, just a wall, a whole house or a piece of furniture. Like fashion, the colours you choose to surround yourself with in your space is a reflection of your personal style. That’s why it’s taken you 5 years to pick just the perfect shade of blue and you’re totally embarrassed of you builders white walls. Shame on you. Would you go out dressed in white sweat pants? Ok, maybe some people would but you’re better than that. It’s time to shake off the indecision and express yourself. 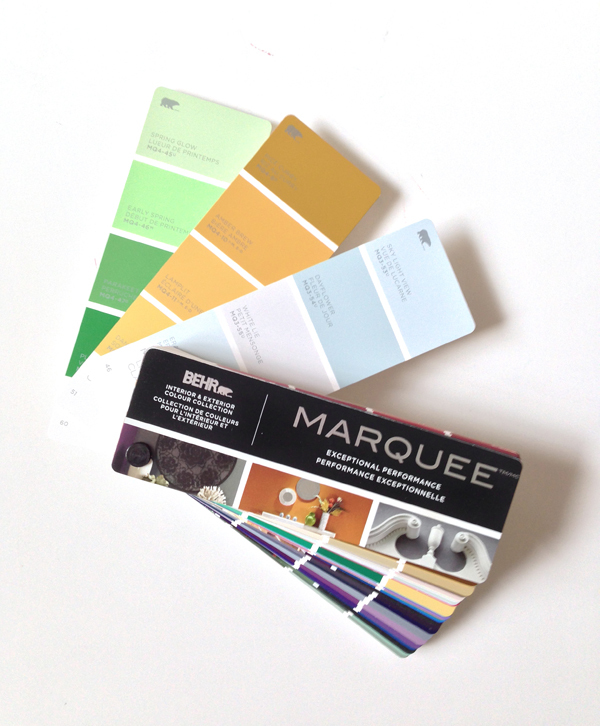 Behr’s new line up of Marquee colours available at The Home Depot are just what you need. If you’ve used Behr before you know how awesome the coverage is with their primer & paint combo. You can usually get away with one coat. Lazy people (me) rejoice. Now are you inspired to get’er done this spring and summer? Yeah, I thought so. I bet $500 at The Home Depot would really help. Here’s how you can enter for your chance to win a $500 gift card. 1 You’ve already seen my favourite picks above. Hopefully you don’t hate them. 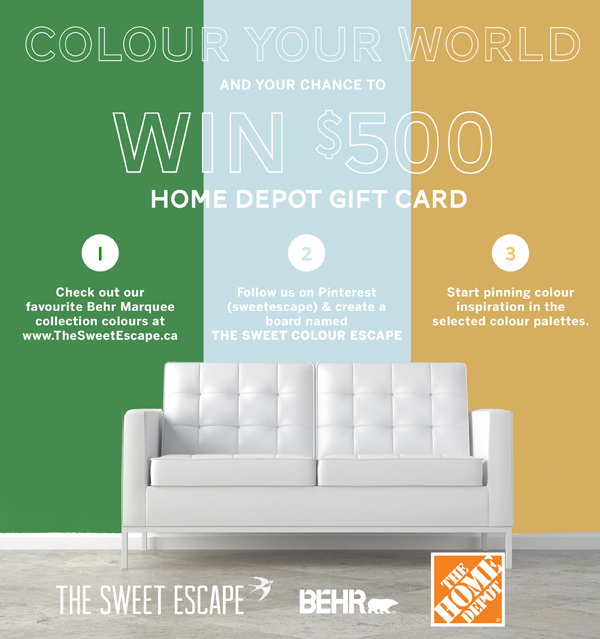 2 Follow The Sweet Escape on Pinterest and create a board named THE SWEET COLOUR ESCAPE and tag your pins with#thesweetcolourescape. 3 Then start pinning inspiration in the above colour palettes. Feel free to also create a moodboard of your own if you’re feeling creative and upload to your board. I’ll be checking out your boards and re-pinning some of my favourites on my own board. 4 Leave a link to your Pinterest board in the comments section below so I can check out all your great colour inspiration. * winner will be chosen on the morning of Friday, May 30th, 2014 and announced via twitter (_the_sweetest_). You must be a resident of Canada to enter (excluding residents of Québec). I’m on the lookout for the perfect grey with blue undertones for our upcoming kitchen remodel, thanks for helping me get started! Hey Shannon, unfortunately this link can’t be found. Any chance you edited it recently? Totally up my pinning alley! Love the colours you chose. I am getting to pinning RIGHT now! Those grey-blue picks in your mood board are gorgeous. I didn’t think rope could look so pretty. What a fun contest, Melissa! I love the colours you chose! I’m definitely choosing shades of grey and blue for our upcoming house project. In love with your inspirations and your contest! Oh my those blues/greys!! My eyes are always drawn to them! I especially love that River Veil – must check out that colour! Your inspiration images are beautiful Melissa! You have a great eye for pulling colours together! I LOVE when a paint goes on nicely in one coat… gone are the days when two coats are required!